Cynthia: This week I read a sweet and amazing book: “PuddleJumping” by Amber L. Johnson. It’s a short and beautiful love story about a very special boy and an amazing girl that loves him unconditionally. The author writes from the heart and it’s a world she is well versed in. Hrmmm… what was this “thing” that made him so special? And what was the decision!!? It was only (and still is as of the date of this review), so I was lucky that a few of you jumped on it, ’cause shortly thereafter, I received a few more recommendations. Bev: Puddle Jumping was so sweet. It was just a novella and I wish it was longer. and he decided! He one-clicked it for me, and I was reading it now. *shrug* Yep, sometimes, I throw caution to the wind and just “go” with his decisions. 😉 After all, how can you turn down a boy’s request for you to read a book that he bought for you… right? I mean, in essence, it was 80% completely high-school driven, and being in her mind was well… like being in a silly-sweet, somewhat naive, definitely innocent teenager’s mind. The whole way through. And it was PG. Maybe even just “G”. 😉 There were no bad boys. No tattoos. No super-steam. No college-life crazy drama. No marital issues to tear my heart apart. No love triangles. No dark-themes to keep me on the edge of my seat. BUT!!! Actually… there was ONE thing that I can’t resist in a romance book, and that is an unconventional love story. <— AND THIS had that! Lily and Colton become fast-friends at a young age (so cute! ), but she kept on getting herself (and subsequently, him, too) into danger. Well, not really, but at 5 and 6 years old, she sure as heck managed to scare both sets of parents with the lightning strikes, and the stitches and well… you get the picture. His mom broke them up as children (putting an end to their adorable friendship), and she never saw him again. But she never forgot him either. And when he enrolls in her high school many years later, their connection re-ignites almost immediately. I’m stopping there. I went in totally blind (thanks to my husband for not letting me see the email that convinced him I needed to read this… I *spoilered* it out, above), so when things started coming together, and the reveals were made crystal clear, I was VERY excited. I was IN!!! I couldn’t wait to see, NO!! experience how this one would play out. There were so many possibilities, and I was so pleased with where the author took us. Because she allowed us her “crush”. That initial intensity. She allowed us that “getting to know you” period. The realizations. The adjustments. The misunderstandings. The personal connection that rivals all others. And the disappointments. The innocence of first love… and first heartbreak. The angst. It’s all there. Yes… it’s “PG”, and yes, I felt as if I was hanging out with a fifteen year old (okay, maybe 17 year old… depends on which part of the book you’re on – it definitely had that young feel) BUT!!!! I couldn’t stop (didn’t want to stop) reading it. 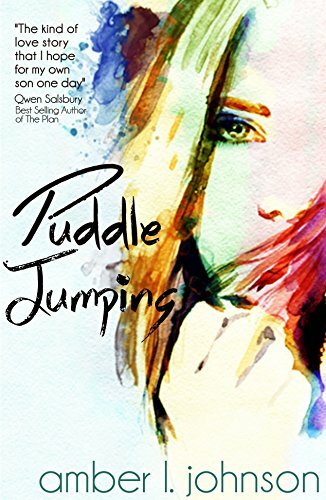 Puddle Jumping is so good, and there isn’t a thing about this book that I could forget. It’s unforgettable, unique, thoroughly entertaining and easy to connect to. Thank you husband (and recommenders!). I had a sweet evening full of “feels”. I could not put it down once I started. Great review in explaining why so sweet. I was going to rec an adult book in this vein, historical though, but would give spoiler away, lol. I 1-clicked this one a couple weeks ago too! I am half way through Finding Home (which i am loving) and then going to read this one! Thanks for the great recommendations! It’s pretty popular book so probably not hard to find. I haven’t signed up for spoiler forum but could and maybe leave it there. Ah man… this was soooooo sweet. I work with children every day just like Colton… so this pulled at my heart strings even more so than usual. I am recommending it to a friend who is raising her own Colton. I know she’s going to love it. I loved even the silly details because they are SO TRUE for Colton… toothpaste (ha!). Thanks for recommending it. Very satisfying Sunday afternoon read. Great for anyone who likes coming of age romance. Agreed… 4 STARS… only because it was so short! o.k. posted. That was a long journey. Apparently my name is very spammy. So I had to make up a new one. Then they said my email was already being used. So used the one I well never use. And guess which folder they sent confirm email too? Yes the spam one, o_O I didn’t even know I had one so kept checking all day, lol. I read this book today! It brought a smile to my face. I just loved it! Both characters were wonderful! Yay! I LOVE unconventional love stories. I love that they are never easy and that we get to indulge in every aspect. Since getting you to read my faves on your TBR list is an ongoing mission of mine (LOL) I’ll give you a few more reasons to pick The Rosie Project (if you’re in the mood)… it’s like Puddle Jumping all grown up: longer full length novel, really quirky but lovable Aspie hero, a mess of a heroine who cracks you up the whole time but accepts him for exactly who he is (and isn’t that truly the central theme? ), ans so so many “toothpaste” like moments. It was completely different and I just loved it. So, again, if you’re really in the mood for Puddle Jumping all grown up… give Rose Project a try!